Goldenrod is the source of mild debate in the plant world. Should this flower be considered a type of wildflower or a type of weed? The decision is a matter of opinion, so the answer is really up to you. Goldenrod is an attractive plant only when in bloom, and its stalk and leaves have a "weedy" look. It's bloom time, depending on the type of goldenrod, extends from midsummer or late summer until the frost in cold climates. For some, the beauty provided by this flower for those two or three months is enough to earn it a spot in their wildflower garden. But weed or wildflower, goldenrod is not a source of allergens, as is commonly believed. Goldenrod is an herbaceous perennial. Plant taxonomy classifies goldenrod in the genus, Solidago. That genus name comes from two Latin words: solidus (whole) and ago (make). So in what sense can this plant make you whole? The name alludes to its medicinal uses as an anti-inflammatory and a diuretic. 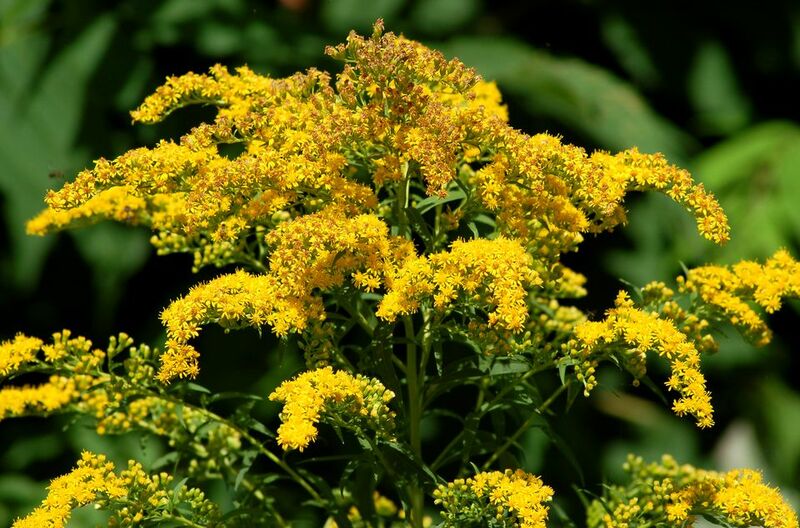 Goldenrod also was traditionally used as a vulnerary herb (that is, a plant used to promote the healing of wounds), as were sweet woodruff (Galium odoratum) and yarrow (Achillea millefolium). There are many species of goldenrod. One of the more widespread (and more striking) types of this flower is the common or "Canada" goldenrod plant (S. canadensis). In addition to being the name of a wildflower, "goldenrod" is also the name of a color, describing a yellow similar to the plant's flowers. The flowers of S. canadensis occur in tufts, and the overall plant can grow as high as 10 feet tall, but it commonly reaches only about half that height. Although there are many types of goldenrod flowers, this perennial is, generally speaking, a tall, slim plant topped off with fluffy, golden flower spikes. Thus the most likely origin of the common name: golden (for the flower color) + rod (a reference to the spindly shape of this wildflower). Most types of goldenrod are native to North America, where they grow as wildflowers in pastures and along roadsides. There are goldenrods as far north as USDA plant hardiness zone 2 and as far south as at least zone 8. In its native region, goldenrod requires little care. For the sake of having a tidy yard, you may wish to cut down the dead stalks in late fall and compost them. Divide and transplant in spring if you wish to increase your supply of the plant, but be warned that this plant can be aggressive. The plants often develop rounded swellings on their stems called galls. The galls are caused by insects but do not do any harm. True to its reputation as a weed, goldenrod is an aggressive spreader that may take over an area and form a monoculture (that is, no other plants will be able to compete with it). This wildflower may thus be considered an invasive plant outside its native range. The plants spread not only by reseeding but also via underground rhizomes, which is a potent combination that helps account for their being invasive. If you grow a wild version, one way to check the spread of its rhizomes is by using bamboo barriers. Another way (if you have just a small number of the plants) is to transplant often so that your goldenrod never quite feels "at home." Once it becomes settled, that's when it tends to start spreading. To keep goldenrod flowers from reseeding, cut off the flower heads before seeds develop. Since goldenrod plants have stiff stems, it is easy to use them in flower arrangements. Fortunately, one warning that you will hear concerning this flower is mainly a myth. People who speak of "goldenrod allergy" are usually guilty of blaming the wrong weed for their hay fever. The real culprit, in most cases, is ragweed (Ambrosia spp.). Once you see what ragweed looks like, there is really no mistaking the two plants, because they look totally different from one another. Ragweed is one of the truly noxious weeds. This flower is widely known as a plant that attracts butterflies. Canada goldenrod is a food source for the following butterflies, including monarch, clouded sulfur, American small copper, and gray hairstreak. Goldenrod also attracts a number of other insects, including bees. Zigzag (S. flexicaulis): The origin of its colorful common name lies in the fact that its stem actually does zigzag. It grows to be 3 feet tall. Old-field (S. nemoralis): Somewhat on the short side, by comparison, old-field goldenrod stands 2.5 feet tall. Its flower heads are more cylinder-like than tuft-like. Bog or "swamp" goldenrod (S. uliginosa): As its common names suggest, this 4-foot plant performs better in areas with wet soil than most types. Seaside (S. sempervirens): Just as there is a goldenrod for swampy areas, so there is there a variety for the seashore. This is the kind to grow if you need a salt-tolerant plant. Its height varies greatly (1 to 8 feet tall) depending on growing conditions. White goldenrod (S. bicolor): Noteworthy simply because it does not have golden-yellow flowers, this white-flowered kind grows to be 1 to 3 feet tall.